A new period started on 1 January 2015 in the life of the Alba Regia Symphony Orchestra, as an independent institution it could act more intensively for the diversity of Hungarian cultural life. 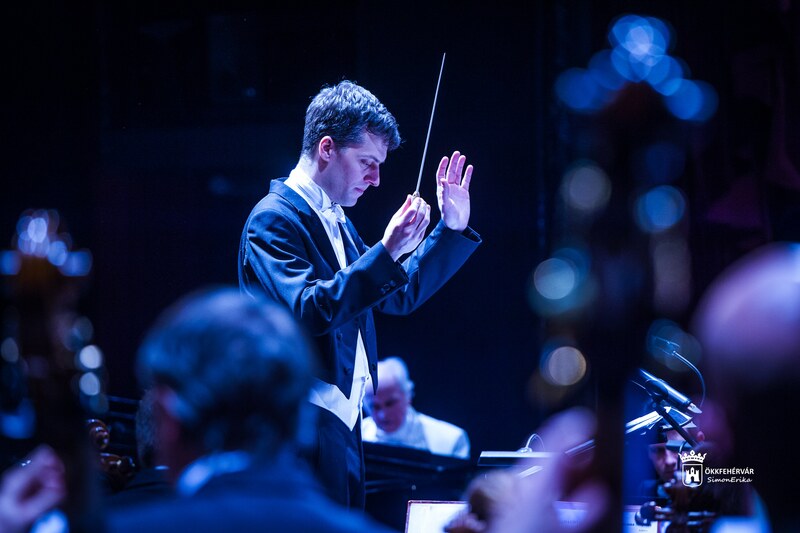 The artistic work of the orchestra is currently directed by conductor Gergely Dubóczky. The Székesfehérvár (Hungary)-based Alba Regia Symphony Orchestra has a history of more than a century: its legal predecessor was the Association of Music Lovers of Székesfehérvár, which was founded in 1901, and it was an orchestra of outstanding scale and standard nationally, which successfully established the practice of symphonic concerts in the city, with the direction of such excellent conductors as Richárd Fricsay. The association was reorganised in 1950 under the name Székesfehérvár Symphony Orchestra: for a long time it had worked in co-operation with Theatre Vörösmarty, until it became independent on 1 January 2015. During the last decades such an orchestra has operated in the City of Kings which has guarded the traditions with respect, yet it has continuously renewed itself, with its programmes compiled for various generations and the music lovers of different genres it has served the requirements of the audience living in the city and its surroundings fond of music at a high level. In this work it co-operates with the other music ensembles of Székesfehérvár, it monitors and, in as much as it is possible, it provides an opportunity for young artists of the region to go on stage, yet it also emphasises that as many musicians of national and international fame should appear on the stages of the city as possible. The list of names of artists – including conductors, singers and instrumental artists – who have played in recent decades in Székesfehérvár commands respect: without providing a comprehensive list, we can mention the names of conductors (András Koródi, Miklós Erdélyi, Ádám Medveczky), piano artists (Annie Fischer, Dezső Ránki, Gergely Bogányi), violinists (Dénes Kovács, Albert Kocsis, Miklós Szenthelyi, Vilmos Szabadi) and opera singers (Erzsébet Házy, Andrea Rost, Erika Miklósa, Csilla Boross, József Simándy, György Radnai, Mihály Kálmándy). In recent decades Alba Regia Symphony Orchestra has performed in Hungarian concert stages with great success. In 2007 it was invited for the first time to the Palace of Arts of Budapest (to the Béla Bartók National Concert Hall), it performed in the Academy of Music, and in this season it will also give a concert in the Kodály Centre in Pécs. Naturally the most important task of the orchestra, reorganised three years ago, is to fulfil the flagship role in the musical life of Székesfehérvár: in addition to the traditional concerts of Easter, Christmas and All Souls’ Day, they are permanent participants of the season ticket concerts of the Philharmonic. They await the interested music lovers with four of their own series: the “Score Series of Concerts for the Youth”, which is aimed at the younger generation; the “Ferenc Farkas Concert Season Ticket” of symphonic orchestra; the series “ Harmonia Albensis – Church Concerts”, which turns the downtown of the city into a location of festival during summers; and the “Ferenc Somorjai Chamber Orchestra Concert Series”. And the concert “Musica Sacra”, one of the greatest events of the cultural life of Székesfehérvár, has already become a part of the carefully guarded traditions of the orchestra. This event presents the masterpieces of church music on the enormous open-air stage built above the ruins of the crowning Basilica. The repertoire of the orchestra ranges from Baroque to contemporary music, paying special attention to oratorical genres: in general they perform the works of Bach, Händel, Mozart, Liszt, Brahms or Verdi with the participation of the choirs of the city. Recently they have been active in the presentation of early music, but high-standard popular music also appears in their repertoire, and they play theatrical music at a high level: they played with great success, along others, two theatrical works of Kodály (János Háry, and The Spinning Room); Cavalleria Rusticana [Rustic Chivalry] by Mascagni; and The Marriage of Figaro by Mozart; and several popular operettas. The orchestra, which plays a pivotal role in the artistic life of Székesfehérvár, has already become famous internationally as well, thus, making a name for itself and the City of Kings: last year they gave successful concerts in the renowned theatres of Italy (in Lecce and Florence), and at the beginning of 2018 they performed a tour in England in co-operation with the Moscow City Ballet, giving concerts to the audiences in Nottingham (Royal Concert Hall) and Manchester (Palace Theatre).